Carl “Hawk” May (Gruner) is a mercenary. Nicholas Turturro and Sam Bottoms (brothers of John and Timothy, respectively), play his two comrades-in-arms. It appears this time, a very rich woman, Patricia Van Lier (Christian) has paid the gang to retrieve her accountant, Charlie Love (Townsend), who has been taken hostage by rebels in the jungles of South America. Hawk goes deep into the foliage to find him, while the others stay behind and contact him via radio. Hawk does indeed find Charlie, and the two are the original odd couple: Hawk is serious and straight-faced, while Charlie is a joker. They must navigate all manner of traps, pitfalls and killer bad guys as they attempt to exit the jungle alive. But will Hawk snap at having to be subjected to Charlie’s antics the whole time? 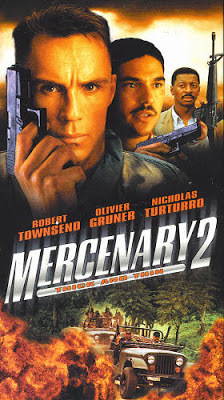 Unfortunately, Mercenary II is just not very good. Even though it has reasonably high production values, and a decent cast, those two positives are smothered by a paint-by-numbers script which is nothing more than your standard jungle slog we’ve seen so many times before. Nicholas Turturro plays the “comedy irritant”, the Joe Pesci-like Italian guy (with the code name “Pizza Man”) who never shuts up and has an annoying nasal voice. How did he get into the Mercenary business anyway? Robert Townsend tries to liven up the proceedings with wacky dances, faces, and one-liners, but it’s not enough to make the movie as a whole very interesting or engaging. Gruner is decent as the stone-faced Hawk, but the sheer stupidity of the whole venture is overwhelming. The movie doesn’t seem to know what it wants to be. One moment it’s a military-style shoot ‘em up, the next it’s a goofy comedy with Townsend mugging it up for the camera. This mix of serious and goofy can best be described as “goofius”. The Rush Hour (1998) franchise brought this into the mainstream with seemingly big financial benefit...but instead of Jackie Chan, imagine Daniel Bernhardt, Van Damme, or Olivier Gruner as the straight man. Can anyone conclusively confirm that Bernhardt and Gruner are two different people? Have you ever seen them in the same place at the same time? Because if the aforementioned three men are indeed separate people, they should all star in a movie together. A confusing, confusing movie. The movie is probably TRYING to be good (and we should say that Claudia Christian is good in it, especially as the cover model for “Multi Billionaire” magazine), but a bunch of unnecessary pop-cultural references mixed in with some gun-shooting just isn’t enough to get a movie off the ground. Mercenary II is in the vein of Perfect Target (1997), Decoy (1995) and Overkill (1996). If we’re comparing your movie, in any way, shape or form to Overkill, RUN. 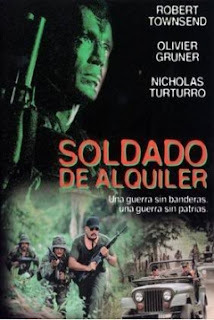 Like Overkill, this movie was shot in Mexico and has an unbelievably lame ending. The writers behind Mercenary II must be thick, because the plot is thin. Avoid. Will have to see the 1st one. We thought this could have been way better. Less comedy...more good action. You'll definitely like the first film better as it's much more serious and has very little comedy, and the action is a lot more brutal. Interesting. Did not know that, we assumed it was more of the same stupidity. If we see it somewhere, we'll check it out. BTW, did you get to see Olympus Has Fallen? It's one of the best Die Hard rip-offs of all time. I did! It was a ton of fun. This was a real Die Hard knockoff...not the fake Die Hard we got in Feburary. Gerard Butler at his best...killing terrorists. I actually enjoyed A Good Day To Die hard and wouldn't call it "fake", it still felt like Die Hard to me. Also looking forward to seeing White House Down. It is going to be tough to beat Olympus!